FUNDAMENTOS BÁSICOS DE LA MICOLOGÍA. MÓDULO 1. 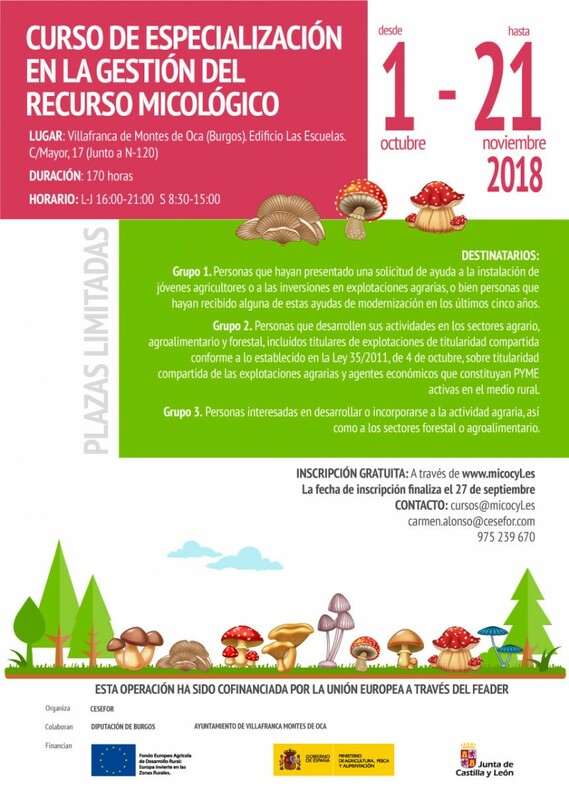 INTRODUCCIÓN AL REINO DE LOS HONGOS. MÓDULO 2. LOS HONGOS Y LA BIODIVERSIDAD. MÓDULO 3. INICIANCIÓN A LA TRUFICULTURA. MÓDULO 5. SETAS TÓXICAS Y TIPOS DE ENVENENAMIENTO. MODULO 6. INTERPRETACION DEL MEDIO NATURAL. MODULO 7. ORDENACIÓN DEL RECURSO MICOLÓGICO. SOCIOECONOMÍA MICOTURÍSTICA PARA EL CURSO DE GUÍAS. MODULO 10. COMERCIALIZACIÓN, IMAGEN Y POSICIONAMIENTO DEL TURISMO RURAL Y EL MICOTURISMO. DESARROLLO DE UN PLAN DE MARKETING. EL GUÍA TURÍSTICO Y SU ESPECIALIZACIÓN EN MICOTURISMO. MODULO 11. INVESTIGACIÓN DE MERCADO EN EL DESARROLLO RURAL Y PRODUCTO MICTURÍSTICO. MODULO 16. EVALUACIÓN DE COSTES Y FINANCIACIÓN MODULO 17. GESTIÓN EMPRESARIAL SOSTENIBLE Y SUS VENTAJAS COMPETITIVAS.